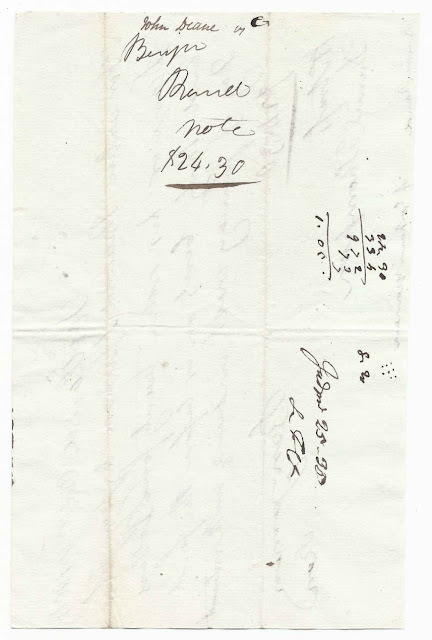 October 8, 1804 document written at Portland, Maine, where Benjamin Rand, "A Gorham Yeoman", promised to pay John Deane $24.30 on or before the first Day of January next. The transaction was witnessed by Daniel Thompson. I found a Benjamin Rand, or perhaps more than one, in Gorham or the surrounding area. Perhaps he was the Benjamin Rand who married Anne Moody at Standish, Maine, on October 14, 1804. Both were residents of Standish, Maine, which abuts Gorham. Perhaps this Benjamin was already farming at Gorham; and perhaps he was needing a loan for his upcoming wedding? 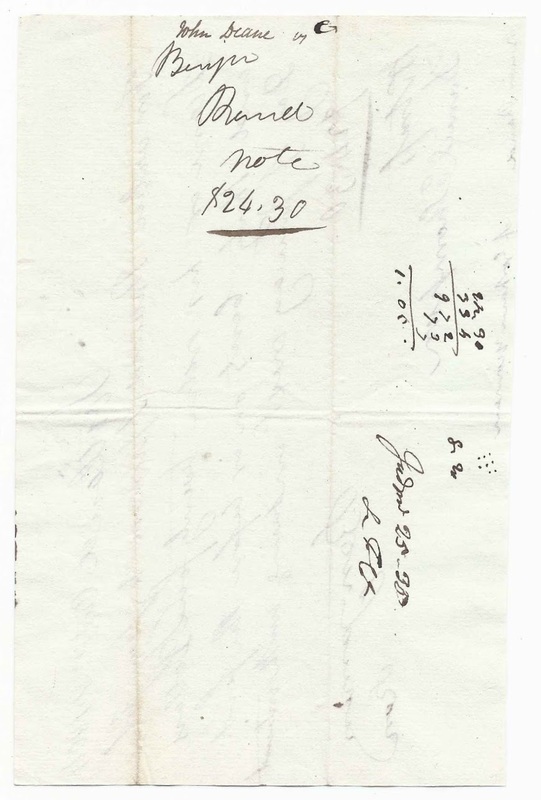 There were several possibilities for a John Dean(e) in Portland, but I was intrigued upon "re-discovering" a John Deane in Standish, Maine, whose name I'd run across earlier when researching an 1801 Standish, Maine, document made by Simeon Sanborn, who promised to pay John Deane $11.60. That John Deane was born 11 June 1743 at Dedham, Massachusetts, son of Samuel and Rachel (Dwight) Deane. On 16 September 1766, at Norton, Massachusetts, John married Miriam Hodges, daughter of Joseph and Miriam Hodges. John and Miriam Dean had at least one child, a daughter Miriam, born 6 January 1878. She married Enoch Freeman Higgins. John's wife Miriam died in 1791, so it's possible that he was the John Deane of Standish, Maine, who married Mary Jewett at Newburyport, Massachusetts on 20 June 1793. 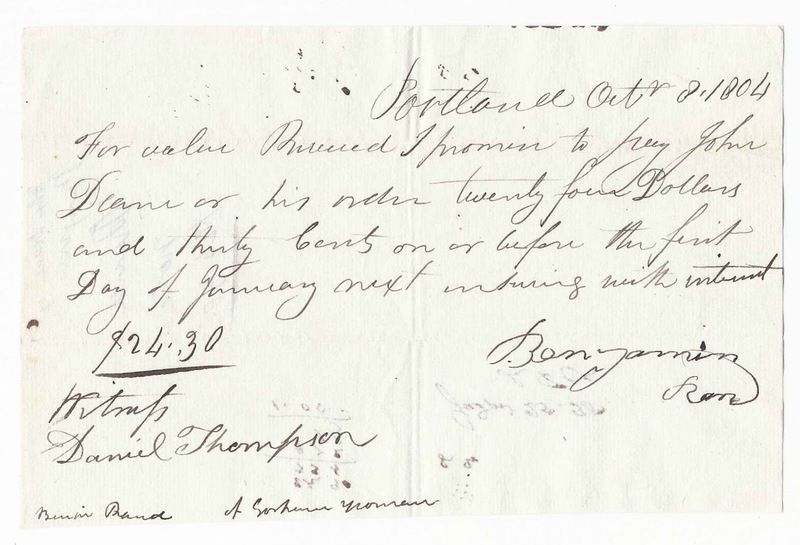 As for Daniel Thompson, it just so happens that there was a Daniel Thompson living at Standish, Maine. I found where a Daniel S. Thompson married the widow Charlotte Thompson on 8 September 1799. If these Standish men are the men named in the document, they may have had business at Portland, and made the document while there. Perhaps the Standish John Deane was at Portland because of his work as a Justice of the Peace. If you have corrections and/or additions to the information above, or an alternate theory as to the identity of one or more of these men, please leave a comment or contact me directly. Thanks!